The majority of cyber attacks begin with phishing emails and websites. Attackers use many tricks, including by leveraging enterprise brand assets, such as company names and logos, to develop phishing websites that appear authentic and lure internet users to enter valuable information such as user names and passwords. Phishing Protection helps prevent users from accessing phishing sites by identifying various signals associated with malicious content, including the use of your brand assets, classifying malicious content that uses your brand and reporting the unsafe URLs to Google Safe Browsing. Once a site is propagated to Safe Browsing, users will see warnings across more than three billion devices. Users can be easily deceived into entering sensitive information on phishing websites that appear to be legitimate by impersonating your business and by leveraging your branded enterprise assets like names and logos. 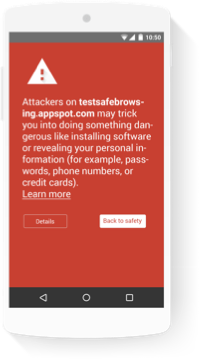 With Phishing Protection, you can report URLs directly to Google Safe Browsing. Phishing websites that leverage your enterprise assets are damaging to your brand and your users. With Phishing Protection, you can quickly help remediate unsafe URLs by reporting them to Google Safe Browsing. Once confirmed phishing URLs are populated into Safe Browsing lists, users on more than 3 billion devices will be warned before they click on infected links. Phishing Protection results are surfaced in the Cloud Security Command Center dashboard. This enables users to view the results in a single pane of glass with additional cloud security findings such as malware, botnets, and web-based vulnerabilities. Use the Phishing Protection API to easily report unsafe URLs that target your users or impersonate your business. View detailed reports that provide an overview of the unsafe pages that have been found and added to the Safe Browsing list. Report known phishing URLs to Safe Browsing so that users are warned before they click infected links. View Phishing Protection findings right from the Cloud Security Command Center console, your single pane of glass for other cloud security findings such as malware, botnets, and web-based vulnerabilities. Sign up for beta access to report and help mitigate phishing sites that target your users.